To the west of the Ural Mountains, from the river basins of the Vychegda and Pechora up to the ocean, lies the homeland of the Komi people. With a population of about 550,000, their culture spans a wide swath of geography, subgroups, dialects, and ways of life. 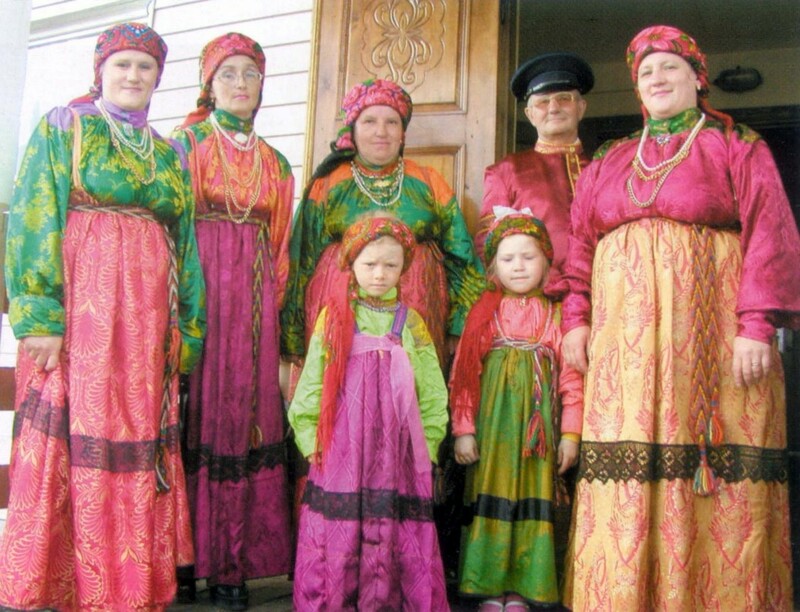 Most live in the Komi Republic, with some populations also living in neighboring areas, from the Murmansk Oblast to the Yamalo-Nenets Autonomous Region. 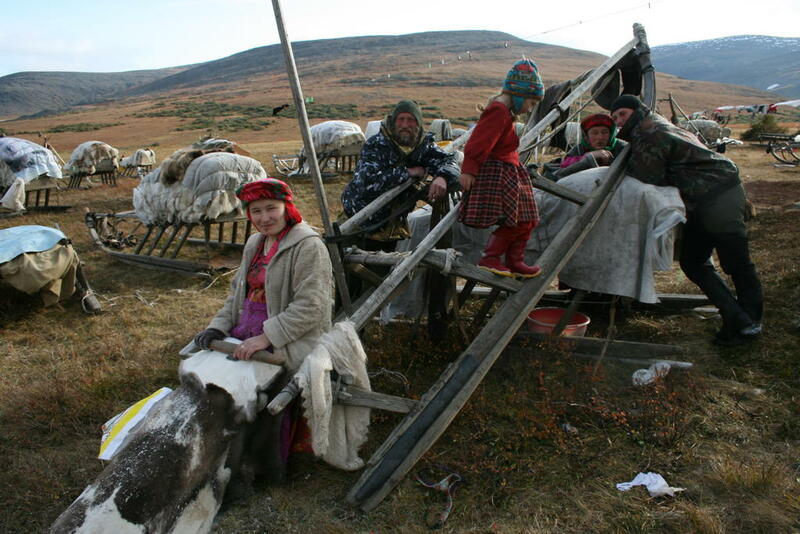 Though elements of Komi culture have succumbed to the pressures of assimilation, the northernmost subgroup, the Komi-Izhemtsy, has retained much of its traditional lifestyle. Numbering about 15,000, the people take their name from the Izhma River, which twists through meadows, bogs and forests before emptying into the Pechora at Ust-Izhma. 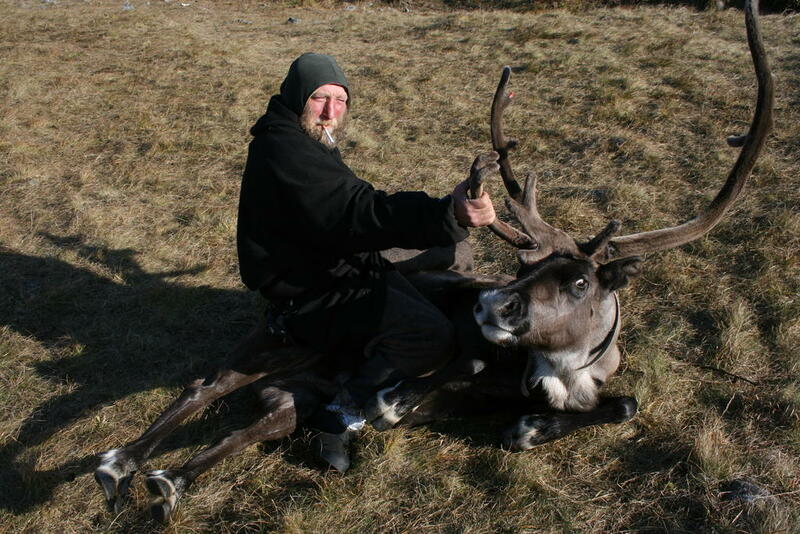 Through the centuries, they have sustained themselves with hunting, fishing, and – starting in the 17th century – reindeer herding. ​Borrowing Nenets practices but making their own modifications, the Komi had become one of the largest reindeer herding groups in the world by the end of the 19th century. 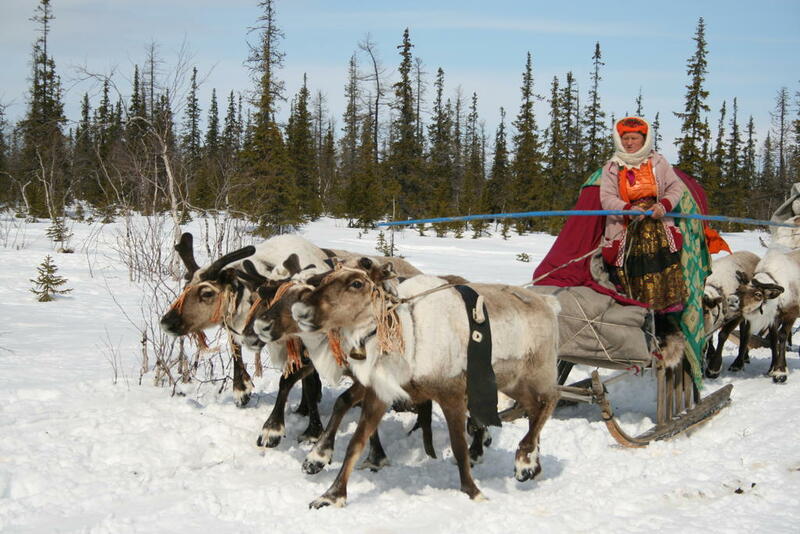 Reindeer are used for transportation, along with wood and birchbark boats that were traditionally used up and down the rivers. Reindeer meat and fish, salted for preservation, form a large part of their conventional diet. 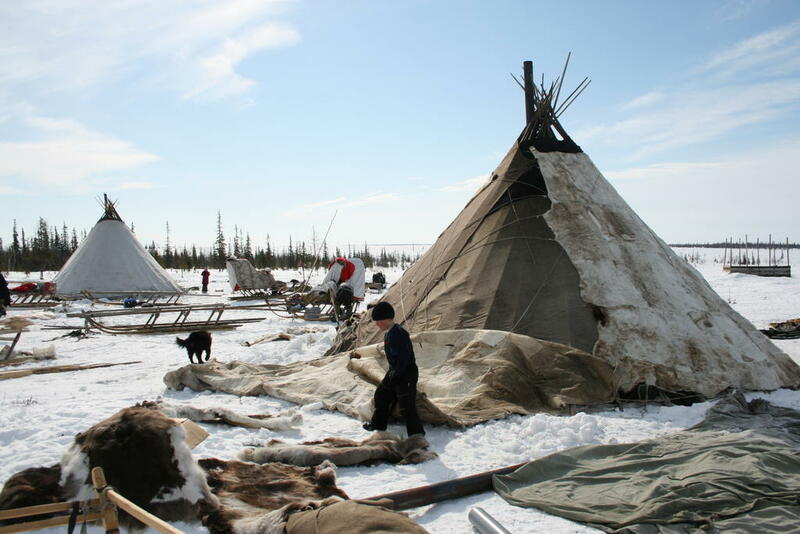 Deerskin has also provided their clothing, from the hooded malitsa to well-insulated boots. The Komi have long felt the tug-of-war between cultural traditions and assimilation. By the 12th century, Russian traders from Novgorod began expanding into their territory, eager for animal furs. The 14th century witnessed the Komi conversion to Orthodox Christianity, at least in part, and the following centuries brought the disastrous effects of industrialization, penal colony relocation, and Stalin's repressive regime. Despite the forces that have taken a toll on their culture, language and population, many of their original practices and values continue to sustain them. The Komi today still herd reindeer along familiar migratory routes, traveling 400 kilometers from their winter location in the forest tundra to spend their summers in the Nenets Autonomous Region. Komi values and beliefs are evident in their oral traditions and folklore. The number of "old believers" in their ancient animism is dwindling, but their deep-seated relationship with the natural environment is kept alive. Water spirits were once associated with fishermen, forest spirits with hunters. Sacred animals have always been honored in the Komi culture, especially the pike and the duck. Consequently, the bones of these animals – the jawbone of the pike, the breastbone of the duck – have been used to make protective amulets. Hunters also wore amulets of bear claws and fangs. Trees were also seen as sacred, and alder trees were believed to hold the spirit of the deceased. In some cemeteries, tree stumps can still be found near Komi graves alongside the Orthodox crosses. The Komi are also known for their musical prowess; songs originally accompanied all aspects of life from birth to death. Of particular cultural note, resisting influence from outside cultures, are their bridal songs, laments for mourning and epics. Likewise, they have troves of legends, riddles, limericks, and stories of wizards, healers, and personified animals. Their stories emphasize the bond with nature, their ideal of hard work, and their generous hospitality. When it comes to artwork, centuries of experience have made the Komi well-versed in wood carving. Wooden household items are beautiful as well as functional, including dishes, utensils, decorations and ornaments. Beyond carving, they are also skilled in jewelry making, metalworking, stamping and engraving. Braided baskets or other crafts are created by intricately weaving pine tree roots, straw or birch bark. Komi knitting is highly developed, with each region creating their own distinct patterns of five spokes. Their materials come, as they always have, from the land, whether skin, bone, bark or wood. As the Komi people persevere in their way of life, they know they face the pressures of cultural homogenization in today's world. Even so, just as their traditions have remained integral to their identity thus far, so too will they accompany them in the path forward as they strive to preserve their heritage.